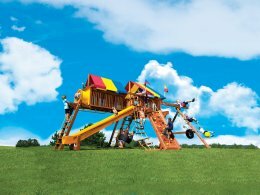 Rainbow Play Systems Swing Sets are so much more than just playground equipment for your kids to swing, slide, and climb on. A Rainbow Swing Set is where kids get to be kids again. No TVs. No electronics. No phones. Just fresh air, exercise, and fun they’ll remember all their lives. Trusted & Tough — Kids wear out their things faster than the knees of their jeans. That’s why we make Rainbow Swing Sets tough. 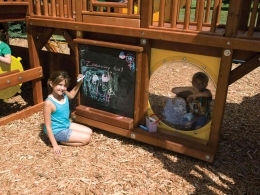 You can trust that your Rainbow is made with superior 100% Cedar materials that are durable, long-lasting, and stable. 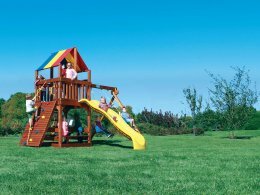 With vinyl-dipped components and commercial-grade hardware, our swing sets are the toughest you can buy. 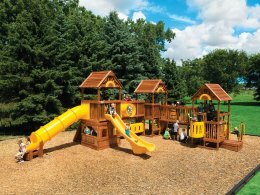 Safe & Secure — Rainbow’s interlocking, notched big beam construction is held in place with recessed hardware and safety caps, eliminating tripping hazards on all play surfaces. And because Rainbow uses only commercial grade hardware, a Rainbow Swing Sets has virtually no weight restrictions. While it won’t hold an elephant (and we don’t recommend you try that) it can safely support the weight of a neighborhood of kids. Expandable — From the time your toddler wants a push on the swing until your tween is climbing a rock wall, your kids grow and change. Because they’re modular, Rainbow Swing Sets grow right along with them, allowing you to add and expand your swing set so kids never lose interest and are challenged as they grow. Long Lasting — Because Rainbow Swing Sets are made of 100% Cedar and undergo our exclusive 10-step water seal process, they split, warp, and shrink less, plus hold up to hot summers and harsh winters better than any other brand. Professional Installation — A huge box with hundreds of parts and pages of instructions is every parent’s nightmare. That’s why our fully trained staff can quickly and professionally install your Rainbow Swing Set in just one day. Adaptable to Every Yard — We realize not every backyard is a perfectly flat, square patch of grass, so we designed backyard swing set options to make it possible for your Rainbow to safely fit your yard, even if it’s small or unlevel. Lifetime Warranty — Your Rainbow Swing Set is a valuable investment. We don’t take that lightly. That’s why we stand behind our products by offering you the best warranty coverage in the business. We’re committed to helping you choose the ideal Rainbow Swing Set for your kids. That starts when you’re simply “just looking” and continues all the way to installation and beyond. Browse our catalog for all the styles, sizes, and options available. Or, for superior service and one-on-one attention, we invite you to bring the kids to one of our three conveniently located showrooms in Bloomington, St. Cloud, or Sioux Falls so they can try before you buy. When you stop by, we’ll be happy to help you design your very own customized Rainbow Swing Set, plus discuss pricing that fits your budget. Sign up and receive a FREE Giant Ship Wheel upgrade when you purchase a Rainbow Swing Set within the next 14 days.